Twelve-year old Darren has his beach vacation interrupted by a sudden encounter with a bloodsucking vampire. His day begins by finding a Conch Shell in the sand. Suddenly, the sand beneath his feet swirls, and he is sucked into this sand-whirlwind, ultimately landing in a dark, red-walled Underworld. To his further surprise, he finds his younger brother, Jeremy, trapped in a force field in the center of a large chamber. Jeremy tells Darren that a vampire trapped him in the force field. The vampire then shows himself, and relates his story to Darren: The vampire became trapped in this Underworld for centuries by Grand Master Quinta after the vampire attacked Quinta’s sister. The vampire demands that Darren free him using Quinta’s wand. 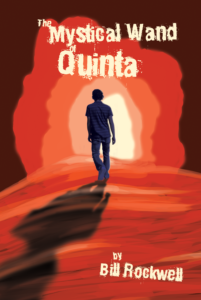 As Quinta’s descendant, he is destined to become the next Grand Master because of his birth order. The vampire then ups the stakes by kidnapping Darren’s parents, and threatening them. Can Darren outsmart the vampire, escape his clutches, save his family, and avoid becoming a vampire, destined to remain in this Underworld Hell forever? The hungry beach sand slurps loudly as it swallows young Jeremy …whole and alive. The day had started with violence and darkness as a summer thunderstorm roared into existence. The weathermen, who had predicted a beautiful day with highs in the eighties, had no explanation for the bad weather, or its sudden disappearance only fifteen minutes after coming into existence. They immediately informed the vacationers along the shoreline of Connecticut to enjoy the day, since no further adverse weather disturbances were expected. Despite this reassurance, an ominous black cloud hangs over the beach. As he walks along the shore of Osprey Beach, Darren drags his toes through the warm, white sand, leaving deep furrows in his wake. His eyes scan the sand for signs of marooned jellyfish, or broken seashells. Don’t want to step on either of those…too painful. Darren gazes up and down the beach. It appears empty. It’s too early for most of the other vacationers. They’ll want to sleep to 10 this morning. Darren, tall for his age of twelve, runs his hand through his long brown hair. His red accents shimmer despite the morning’s dim lighting. The chilly wind blows against his face. He frowns. Forgot my hat again! His hands descend along his long face. It’s scratchy! Yeah! It won’t be long before I’ll need to shave like dad and my brothers…finally. The distasteful smell of decomposing snails fills his nose. “Yuck!” He resists clamping his nose with his fingers. Can’t risk anyone catching me squeezing my nose like some little kid. Birdie, a large, three-year old Black Lab, prances around Darren, wagging her tail, and repeatedly jumping against him, nearly knocking him down. Birdie jumps more excitedly, circling around as if trying to catch her tail, and then prances around Darren. Darren searches for something to toss. Spotting a foot-long stick floating along the shore, Darren points. Birdie bounds into the surf, and grabs the stick mid-jump, amid a gigantic splash. She then turns, and swims back to shore. Birdie drops the stick at Darren’s feet. She then backs off in leaps and bounds, awaiting Darren’s toss. Darren hurls the stick well into the pounding surf. Birdie doesn’t hesitate. She starts her run as soon as she detects the direction of Darren’s toss. Her gaze becomes fixed on the stick as it sails above the waves. She dives into the water, hopping twice before being forced to swim. Grabbing the stick between giant, sharp teeth, she reverses direction, swims for shore, and then sprints to Darren. After dropping the stick, she shakes from head to tail, casting the water from her coat. “Stop that, Birdie! You’re getting me wet.” Darren uses his hands as a shield against the attacking spray. His shirt and shorts become soaked despite this. “These are new clothes! Stop it, Birdie!” He turns his back to the dog, as she continues shaking. When she finishes, she stands above the stick, staring at it. Darren squeezes the tail of his yellow shirt, as if that would drain all the seawater from it. It doesn’t. He bends, picks up the stick, and hurls it into the water again. “Fetch, Birdie, but this time, shake the water off at the water’s edge, not near me, You Silly Dog.” He rubs his hands over his tan shorts. They still feel wet. They repeat this exercise several times as they proceed along the shoreline until Birdie abandons the stick to investigate a large Conch shell, lying on the dry sand, high on the beach. She sniffs it once, and begins a low, guttural growl as she backs away, holds her haunches high, and then places her chin close to the sand between her paws. Her growl becomes louder as Darren approaches. Darren reaches for the pure white shell. Birdie leaps to her feet, and switches her growl to a long series of continual barks, as she jumps into the air several times. The shell shines brilliantly, as if under the bright noonday sun instead of the dark, sunless sky presently overhead. In the next instant, the shell changes color, first to iridescent pink, and then blood red, as a crimson liquid begins to drip onto the sand. Darren’s eyes burst open. He yanks the shell away from his body with one hand to prevent the red liquid from staining his clothes. Birdie barks louder as she backs away from the dripping shell.